Digging through another box of stuff today, I came across two great relics from earlier medicine and science. The first is a phrenology bust. It is probably a late 19th- or early 20th-century reproduction of the L. N. Fowler busts that were fairly common in the latter part of the 19th century. The Fowler brothers, Samuel and Lorenzo, were successful phrenologists in the U.S. and England, where this bust was purportedly made. This bust appears to be different from the one in James Pockett’s recent essay on phrenology and Django Unchained. If phrenology could justify slavery and its abolition, as James Pockett notes, then surely it can help me justify student grades. An L.N. 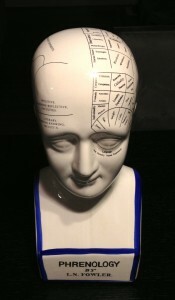 Fowler Phrenology bust. I know nothing about Mrs. Potter, though recently somebody on eBay was selling a ruler with the same advertisement. 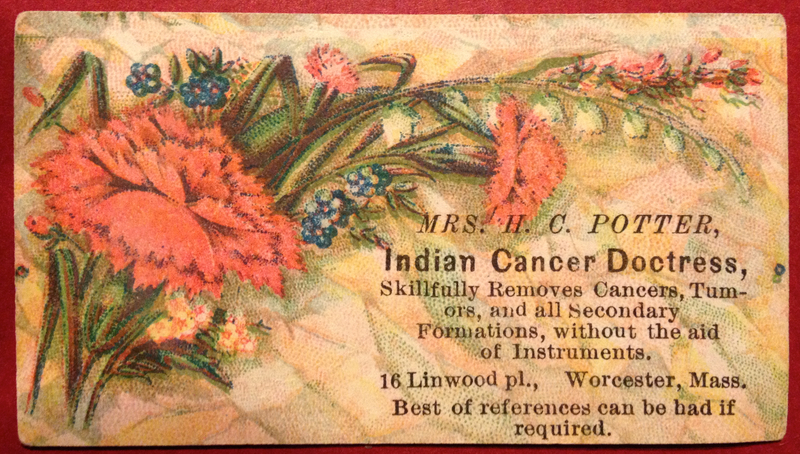 It appears that other women in Massachusetts identified themselves as “Cancer Doctress.” Still others identified as “Indian Doctress.” Then, in the Boston Medical and Surgical Journal (1854) there is a report by W. W. G. of an “Indian Cancer Doctress,” a Mrs. Northrop. Mrs. H.C. Potter, Indian Cancer Doctress business card.